Norman Osborn's Goblin arsenal has been stolen on numerous occasions by individuals that used the weapons toward their own personal agendas. Some things never change, and the Brand New Day universe introduced a new Goblin-esque villain named Menace. Menace had been a consistent thorn in Spider-Man's side throughout Brand New Day, usually popping up to cause havoc in the ongoing New York City mayoral election. The five part story arc Character Assassination, which ran through Amazing Spider-Man #584-588, revealed Menace's identity as well as the villain's origin. 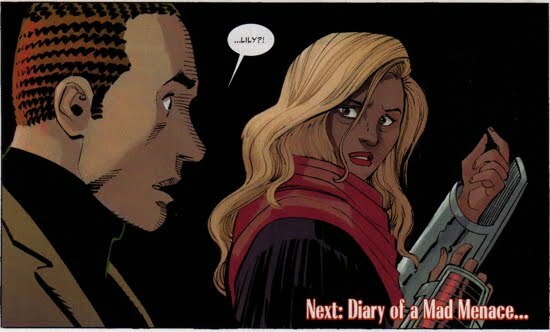 This story arc also brought closure to the Spider-Tracer killer subplot that was ongoing within the Amazing Spider-Man title. 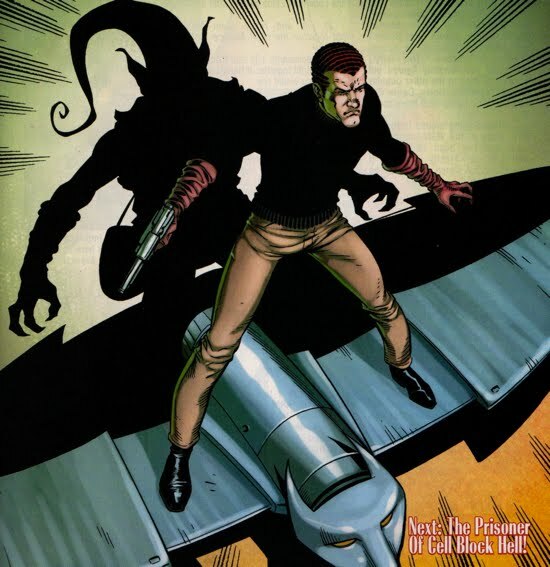 In an effort to keep this website Norman-centric, the synopsis of this arc will be abbreviated in order to focus specifically on the events centering around Norman Osborn. In Amazing Spider-Man #584, the mayoral race is quickly coming to a close and the straight-arrow Councilman Bill Hollister appears to be in the lead. Harry Osborn is dating Councilman Hollister's daughter, Lily, and he decides to take the relationship to the next level and propose to her. 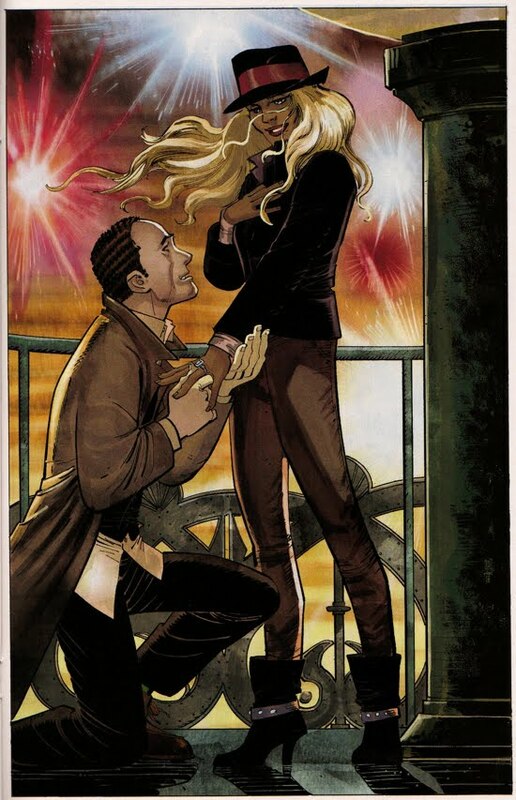 While atop the Statue of Liberty Harry pops the question, but Lily turns him down (technically this occurs at the beginning of Amazing Spider-Man #585). She states that she's concerned about Harry's history. Soon after, she receives a phone call from her father and informs her that the latest polls claim a dead heat between the two candidates. She leaves, leaving Harry alone atop lady liberty. Later, after terrorizing a Hollister rally Menace heads toward the Hollister Campaign Headquarters where Harry is on his way to find Lily. However, Harry's world is rocked when he arrives and finds that Lily is Menace and what is even more unbelievable is that she does not need a mask to become Menace! In Amazing Spider-Man #586 Lily provides Harry with the intimate details of Menace's origin. It seems that when they first started dating Lily was concerned about the late nights and stress that Harry was experiencing. She did not think it was related to his ownership of the Coffee Bean, but rather that he was back off of the wagon once again. So she began secretly going through his stuff and she stumbles upon his journal. In that journal she is able to obtain information regarding the location and access to one of Norman's Goblin hideouts. The trigger to opening the door is one of the books on his book case entitled, The Rise of the Norman Empire. After Lily had acquired this information she invited herself along with Harry on a trip to Oscorp. She then broke into Norman's hideout and just perused the room at first looking for something that would giver her dad "a reason to run for mayor". At first she considers just blackmailing Norman as she claims that "there's enough in that room to indict him in at least half a dozen different ongoing criminal conspiracies". She goes on to say that "just the experiments alone…would violate at least a federal regulation or two". 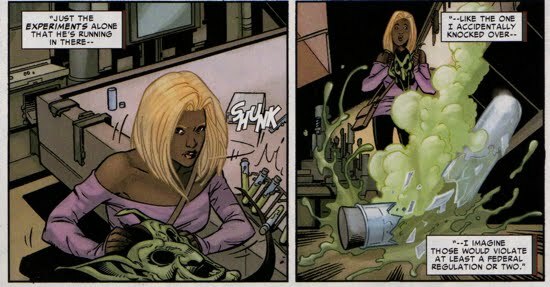 However, Lily accidentally knocks over one of Norman's "experiments" and while she is trying to clean it up, she absorbs some of the liquid onto her skin. The liquid allows her to become the villain Menace by having her body mutate (more like shape-shift) into the horned villain. Soon after, she adopts the identity of Menace and tries to open a slot for her father to run for mayor. After the death of candidate Parfrey, she realized how effective the sympathetic vote is, so she changed her tactics and began harassing the Hollister campaign crew. Suffice it to say, Harry doesn't know how to respond, but after Lily leaves Harry resolves to handling this situation himself. He breaks into Norman's hideout and helps himself to some of the Goblin arsenal. 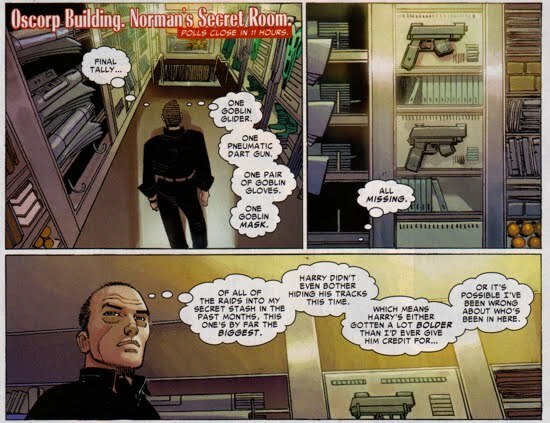 Norman Osborn makes a brief appearance in Amazing Spider-Man #587 where he realizes that his hideout has been raided once again. He had originally thought it to be Harry, but with the increased frequency and quantity of the robberies he begins to suspect that someone else is involved. The Character Assassination story arc concludes in Amazing Spider-Man #588 with two interesting developments. Harry, quasi-garbed as the Green Goblin, thwarts Menace as she is about to pummel Spider-Man into the ground. He injects her with a serum that reverts her transformation and she is publicly exposed as Menace. This destroys her father's chance at becoming New York City mayor, despite having literally just won the election. 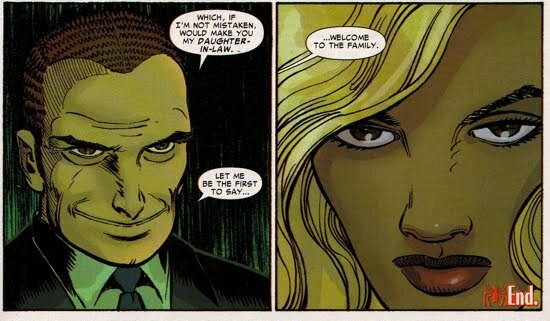 While Lily is in police custody, Norman Osborn approaches her and offers her some positive words of encouragement. He then returns the ring that was in her possession, which had once belonged to Emily Osborn, he then welcomes her to the family. 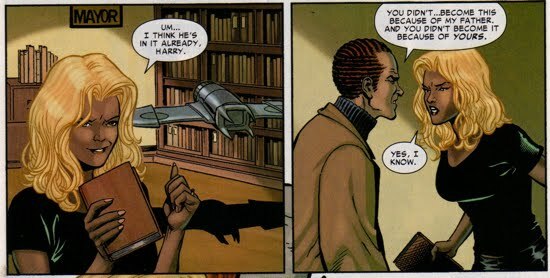 The Harry and Lily romance reached its finality in Amazing Spider-Man Extra #3, where it was revealed that Harry was attending an AA group for help with his recent relapse. He explained to the the group that there has been a lot of nice things in his life that he had allowed to be ruined and he’s decided that he doesn’t want to be the kind of guy that allows that to happen anymore. On his way home from AA, Harry was approached by Lily who is on a Goblin-glider in the form of the villain Menace. She tells him that she’s ‘moved on’ and that she is going to continue being Menace. 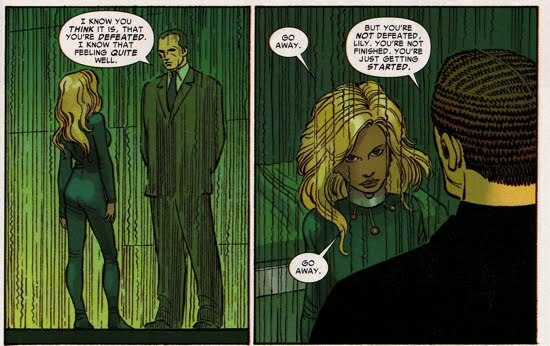 Harry warns her against an alliance with Norman Osborn because, as Harry says, “when he’s through with you, nobody gets to have you”. But Lily is gone before Harry can finish his sentence. The end…for now.